Teams will register, input rosters, and pay in one system – Got Sport. Please create a user profile when registering for the first time. You will need one profile for each team and/or individual runner (elementary and middle school only) you are registering. Each profile will require a unique username and you may reuse your profile year over year once created. Please call us at 407-938-3800 with any questions. Teams are responsible for reading and abiding by eligibility requirements listed in the Rosters & Eligibility shutter. Cross Country 5K Fun Run Participants (Individual Runners only), please check the Fun Run tab for Registration information. Teams participating in the 5K Fun Run may register at the link above. *up to 20 runners per gender, $5.00 for each additional runner over the 20 runner per gender maximum. *If entering a team/club in the 5K Fun Run, refer to team fees listed above. Don't miss your opportunity to stay at a WALT DISNEY WORLD® Resort during the 2018 Disney Cross County Classic. Pricing starts as low as $74* per person at Disney's Pop Century Resort and $107* per person at Disney's Caribbean Beach Resort for a two night stay. Prices are based on quad occupancy. For additional pricing and booking options visit our Disney Sports Event Booking Site, or you can contact Disney Sports Travel at 407-939-7810 or e-mail wdw.disney.sports.travel@disneysports.com. *All package prices listed are per person based on a 4-person occupancy standard room. The number of packages available at this rate are limited and advanced reservations are required. Minimum night stay required. No more than 4-persons per room. Additional fees may apply if more than 2 adults per room. Tickets are valid only on the specific dates of the event and for a limited period of time before and/or after the event. Each day this Ticket is used at any Theme Park constitutes one full day of use. Some activities/events may be separately priced. Age restrictions may apply for access to certain facilities. Numbers of visits depends on number of days of Disney Theme Park Tickets purchased. Ticket types and entitlements subject to change without notice. Tickets are non-transferable and non-refundable. Parking is not included unless staying at Hotels of the WALT DISNEY WORLD® Resort. Sports specially-priced packages are for participants and their spectators. No other discounts apply. Offer is nontransferable. View list of participants here. Continue to check back as more teams are added throughout the registration window. Participants and spectators are responsible for providing their own transportation to and from ESPN Wide World of Sports Complex for competition. 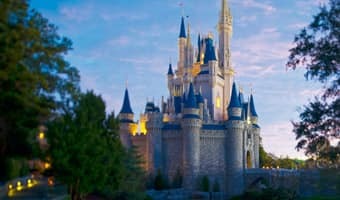 Disney's Magical Express offers the perfect game plan for a hassle free arrival to and from Orlando International Airport. This exclusive, complimentary shuttle and luggage delivery service conveniently provides transportation for your team from Orlando International Airport to and from Walt Disney World® owned and operated resorts. When you book your Disney Cross Country Classic travel package, add on the Disney Dining Plan. The Disney Dining Plan offers a convenient and affordable way to enjoy snacks and meals throughout the Walt Disney World® Resort, including many located in Disney Springs. For additional pricing and booking options contact Disney Sports Travel at 407-939-7810, option #3 or e-mail wdw.disney.sports.travel@disneysports.com. The 2018 Disney Cross Country Classic schedule is now available. Schedule is subject to change. Please view link for more details. Teams must check in at ESPN Wide World of Sports Complex prior to race. Events may be subject to availability, capacity limits, eligibility requirements, and may be subject to delay, change, or cancellation for inclement weather. To be eligible to compete in the High School division, your team must be a member of your official state high school athletic association per NFHS guidelines. Only athletes in grades 9 through 12 are eligible to compete in the high school division. In each varsity race (all age divisions – boys and girls), teams can run a maximum of ten (10) athletes. The top five (5) athletes will determine the individual team score. All other athletes from team's roster will run in the JV races. Register for Disney Cross Country Classic. Submit initial rooming list and confirm Disney Magical Express Reservation with Disney Sports Travel 60 days prior to arrival. Spectator admission is required for entry to the event at ESPN Wide World of Sports Complex. Length-of-Event admission tickets (LOE) allow for admission to both days of the event. **All ticket sales are non-refundable and non-exchangeable. Tickets are subject to availability and capacity limits. Prices may change without notice. Teams have the option of expediting on-site event check-in by choosing Priority Check-In. Teams not participating in Priority Check-In may experience longer wait times as all required documents will need to be collected and verified on-site. Please note a representative from your team is still required to attend on-site check-in to receive admission credentials, timing chips, and race bibs. Please refer to information below for more details. Individual participants please bring completed waiver to on-site check-in. Priority Check-In Information — Deadline to qualify for Priority Check-in is September 21, 2018. Friday, October 5: 10:00 a.m. – 6:00 p.m.
Saturday, October 6: 6:00 a.m. – 9:30 a.m.
A representative from your team or the individual runner (not participating with a team) is required to attend on-site check-in to submit completed coach and athlete waivers. Admission credentials, timing chips, and race bibs will be distributed at that time. Please see on-site check-in schedule above. Scoring - In each varsity race (all divisions – boys and girls), teams can run a maximum of ten (10) athletes however only the first seven (7) runners on each team may enter into scoring. The top five (5) athletes will determine the individual team score. All other athletes from team's roster will run in the JV race and will adhere to the same scoring rules. Upper Elementary: Elementary school athletes in grades 3-5. Middle School: Middle school athletes in grades 5-8. High School: To be eligible to compete in the High School division, your team must be a member of your official state high school athletic association through National Federation of State High School Associations (NFHS). Only grades 9 through 12 are eligible to participate according to NFHS sanctioning guidelines. Teams are responsible for verifying their team's eligibility prior to registering or making travel arrangements. Teams only, no unattached or individual athletes. 5K Fun Run: The Cross Country 5K Fun Run is an unsanctioned race. Individuals ages 5 and up, club teams, and high school teams that do not meet the sanctioning guidelines of the high school division races are welcome to enter this run. Select heats of the Disney Cross Country Classic will once again be available to stream on watchESPN.com. How do I register multiple teams from the same school? A: Teams will register, input rosters, and pay in one system – Got Sport. Please create a user profile when registering for the first time. You will need one profile for each team and/or individual runner you are registering. Each profile will require a unique username and you may reuse your profile year over year once created. Please call us at 407-938-3800 with any questions. A: Unattached runners participating in the elementary, middle school, and college divisions will create a profile using the individual's name instead of the school/team name. 5K Fun Run participants please check back for separate registration details and link. How is the Disney Cross Country Classic scored? A: In each varsity race (all divisions – boys and girls), teams can run a maximum of ten (10) athletes, however only the first seven (7) runners on each team may enter into scoring. The top five (5) athletes will determine the individual team score. All other athletes from team's roster (over 10 athletes varsity limit) will run in the JV races. There is no limit to the number of runners on a JV team but scoring adheres to the same rules. What awards are given to the runners competing in the Disney Cross Country Classic? A: Trophies will be given to the top three (3) athletes and top three (3) teams in each team race (high school, college, and middle school). In each team race, individuals placing 4-10 in will receive a medal. Is there a limit to the number of runners a team can enter in JV races? A: No, there is no limit to the number of runners a team can enter in the JV races. Can I enter as an unattached runner in a Middle School, High School or College Race? A: Unattached runners are not allowed in the High School races. Unattached/Individual athletes are allowed in the Middle School and College divisions. Schedules When and how will I be notified of my schedule? A: A schedule of events is posted under the Planning Tools tab of the event page. Schedules are subject to change. Be sure to check back at disneycrosscountry.com and at on-site event check-in for the most updated schedule. Do you offer discounted travel packages for athletes, coaches, family or fans (spectators)? A:Yes! For the Disney Cross Country Classic all travel accommodations can be made through Disney Sports Travel at 407-939-7810. What type of attire is appropriate during our time at ESPN Wide World of Sports Complex? A: Runners must wear a uniform/jersey for the sanctioned races. If an athlete chooses to wear spikes, quarter inch is recommended. Will shower facilities be available for my team at the conclusion of our competition at ESPN Wide World of Sports Complex? A: No, showers or locker room facilities ARE NOT available at ESPN Wide World of Sports Complex. You will need to make prior arrangements with your Resort front desk based upon availability. Are we allowed to bring coolers in to ESPN Wide World of Sports Complex? Are tents allowed at ESPN Wide World of Sports? Will a trainer be available at all times for my team? A: During events, athletic trainers, provided by Select Medical, are present at the ESPN Wide World of Sports Complex and are able to respond to athlete injuries. Additionally, athletic trainers, provided by Select Medical, may be available for preventative taping pre-event, subject to availability, at no cost, if athletes bring their own tape and pre-wrap. Taping kits may also be purchased at The ESPN Clubhouse Shop at the ESPN Wide World of Sports Complex. Will parents and other spectators have to pay admission into ESPN Wide World of Sports Complex? A: Yes. All spectators are required to purchase admission into ESPN Wide World of Sports Complex. 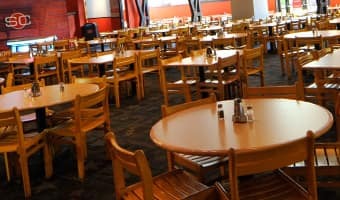 Food/Dining/Catering Can I arrange for a private team banquet or party on the Walt Disney World Resort during our stay? A: Yes! You may call our catering and convention services department at 407-939-4891. They will help you arrange a specific function that will meet your team's needs. Can I arrange for a team meal on the Walt Disney World Resort during our stay? A: Yes! You may call 407.WDW.DINE to make a reservation for your team. Can I arrange for a catered team meal at the sports complex during our stay? A: Yes! Boxed lunches are available for your team. Please click here for more information. Is transportation provided during Disney Cross Country Classic? A: No, teams are responsible for their travel during the event.